Only the handicapped live on Earth. While everyone else uses interstellar portals to travel between hundreds of colony worlds, 17-year-old Jarra is among the one in a thousand people born with an immune system that cannot survive on other planets. Sent to Earth at birth to save her life, abandoned by her parents to be raised a ward of Hospital Earth, she lives a regimented life in one of their impersonal residences. Tortured by the knowledge the stars are forever out of her reach, Jarra dreams of learning to fly a plane so she can at least make the skies of Earth her own. She gets her chance to become a qualified pilot, but learning to fly turns out to be far more difficult and dangerous than she imagined, sending her into a literal trial by fire. EARTH AND FIRE is a prequel novella, set in the distant future of the Earth Girl trilogy (Earth Girl, Earth Star, and Earth Flight). 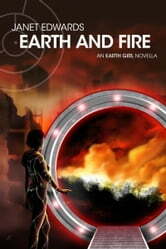 Note that the first two chapters of EARTH AND FIRE have appeared as the title story in the EARTH 2788 short story collection. The other fifteen chapters are entirely new.